What Should I Do If I Have Tea-Stained Teeth? Drinking tea is actually quite good for you. Researchers have found that black tea combats two types of bacteria that are associated with tooth decay and gum disease. Green tea does the same, and even has a compound that can help you get rid of bad breath. While it’s wonderful to know how much tea can help your oral hygiene, another problem arises for many people who love the beverage: tea stained teeth. Want to trade in bad breath and cavities for tea stains? It’s actually not necessary. There are many things you can do to eliminate tea stains so that you can continue enjoying the benefits of this timeless treat. Rinse out your mouth with water after drinking tea. Brush and floss daily to remove plaque, which is a major cause of staining on teeth. Brush your teeth with baking soda. While it won’t bleach your teeth, and it can remove stains. With a paste of baking soda and salt twice a week you can improve your teeth’s whiteness over the long run. Get a quality toothbrush. An electric toothbrush is considered to be more effective in cleaning off the plaque and tartar than a manual one. Learn about foods you can eat that naturally whiten teeth! Teeth Whitening at Home or at the Dentist’s? At-home whitening procedures aren’t as strong as the bleaching you get at the dentist, but if your teeth are in great shape it may be a good option to consider. If you have sensitive teeth/gums, or want a stronger and longer-lasting solution, an in-office procedure may be right for you. 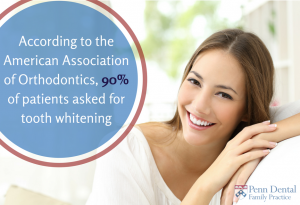 According to the American Association of Orthodontics, 90% of patients asked for tooth whitening! You’re not the only one. One in-office procedure involves a tray that is custom-made for you with a bleaching solution included. The tray is placed over your teeth with the dentist’s supervision. Sometimes, light or heat may be used to speed up the procedure. You might also try the option of a take-home kit from the dentist. You’ll be getting your money’s worth because a custom-made solution will whiten your teeth more quickly than a take-home kit, without irritating your gums. If you’re interested in learning more about whitening solutions for tea stained teeth, learn more here. Penn Dental Family Practice provides cosmetic dentistry of all types for individuals and families. We’re your go-to office where you can get all your dental care under one roof! To be contacted for an appointment, fill out one of our contact forms today!